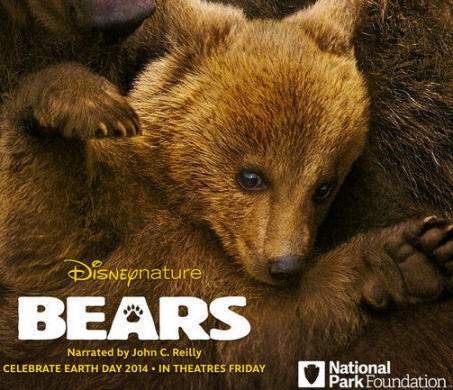 On Saturday my family and I went to Manhattan to a free advanced pre-screening of Disney’s new nature movie “Bears”. We left the house a little late and my husband was worried that we would miss the movie. We ended up getting there about 5 minutes late but there were still seats available in the theater. 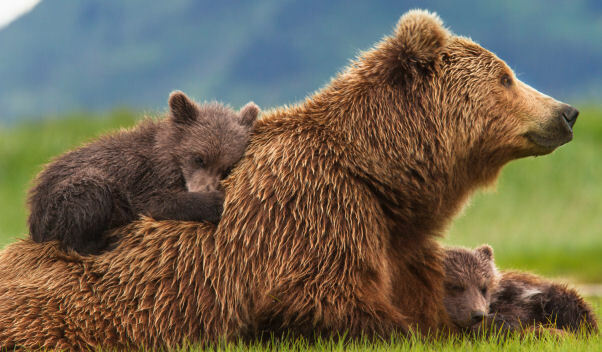 The movie is about the life of a brown bear family that includes a mother bear and her two young cubs. The Disney nature film crew followed around this bear family in order to bring us into their world. We are offered a close up detailed view into their lives. All of the challenges they face as bear cubs in a harsh and dangerous environment. The movie starts out with the winter ending and the cubs and their mother are descending a snowy and treacherous mountainside. As the weather warms and spring approaches the main goal for the mother is to feed her cubs and keep them safe. The dangers they face come from larger and more dominant male bears and a sneaky and conniving lone wolf. While the mother deals with looking out for her cubs she has to worry about finding enough food to build up her fat reserves for the next winter. During her and the cub’s next hibernation she needs to have enough milk to nourish them. The mother shows the cubs how to search for clams and mussels and eventually salmon. The salmon are an essential part of the bears diet and helps them build up their fat reserves. I was truly amazed at how the Disney film crew was able to keep up with this bear family and document their travels through the Alaskan wilderness. At the end of the movie when they are showing the closing credits we get to see just how close the film crew gets to these bears. They must have had nerves of steel because at times they are very close to these goliaths. If their bears decided to attack it would be the end of the film crew for sure. Luckily that didn’t happen and in the end the film crew created a wonderful movie that can be enjoyed by the whole family. What an amazing cute movie! I like the Disney Bears movie because they are showing how the bears live in the wild. I want to see this movie with my family. That looks like a cute movie. I’ve seen previews for it on television.